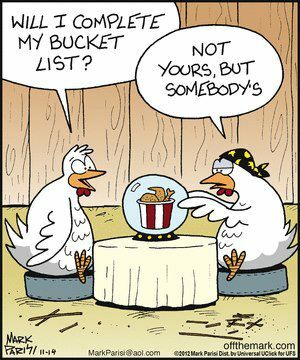 I confess, I don’t have a bucket list. I never even gave one a thought before my dog’s life started winding down. I heard about a dog in Florida that had a bucket list, and I thought coming up with one for our beloved pet of 13 years might be a great way to shift our focus from the inevitable and give our pet a few last romps. We’re all having a good time with it. But before this? I thought the bucket list was just a movie with some old guys in it. Then I came across a blog post from a twenty-something called “My Fall Bucket List.” What? Maybe I didn’t understand what a bucket list was. So I looked it up in the dictionary. 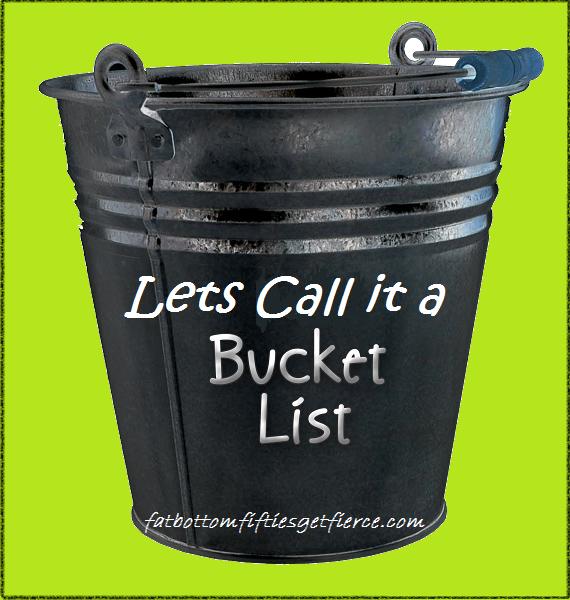 According to Miriam Webster, a bucket list is “a list of things that one has not done before but wants to do before dying.” So, I went back to the blog post to see if the woman was ill. Nope. Apparently she has a bucket list for each season – including the holiday season. They had lots of fun things on them – but many were not things that she (presumably) hadn’t done before (read three books, visit a cider mill, romp through dried leaves, etc). So, if she’s not trying to get it done before she dies, and it’s not something she hasn’t done before, isn’t it just a ‘fun things to do’ list? Are we diluting the whole bucket list concept? (Speaking of diluting experiences, is anybody else appalled that kindergarteners now have graduations? Complete with cap and gowns?? ) Or are we more likely to get things done on our ‘to-do’ list if we frame it more dramatically? Does a label really make a difference in being motivated to accomplish something? I was reading an article by one of those people that will go to your home and get you organized. She was working with a client who had failed miserably at all attempts to de-clutter her home. The organizer gave her an “Action Plan” (which looked suspiciously like a ‘to-do’ list to me) and voila! – the client became committed to the process and went on to execute the action plan. (I’m sure her success had nothing to do with Ms. Organizer cracking a whip behind her during an 8-hour Saturday organizing session). So what I learned is I’m doing it wrong. The reason I’m still so unorganized in spite of my many to-do lists is I’m using the wrong terminology. I’m going to immediately start a bucket list and “Drafting an Action Plan” is going to be the first thing on it. I’ll have to get back to you on the rest of the content because I don’t have time to work on it right now. I have to get my dog to Arby’s for a French Dip. It’s Number 17 on her bucket list.